The CanDance Network is working in tandem with the Coastal First Nations Dance Festival to offer activities for our members in Vancouver from March 1 - March 4, 2018. The four days will include afternoon and evening performances, as well as professional development sessions and a CanDance regional meeting. 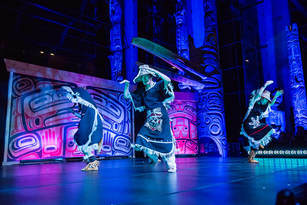 Produced by The Dancers of Damelahamid in partnership with the UBC Museum of Anthropology in Vancouver, the Festival celebrates the stories, songs and dances of the Indigenous peoples of the northwest coast of North America. The delegation will be immersed in the rich cultural traditions practiced by dance groups from British Columbia, the Yukon, Alaska and Washington State, as well as guest international artists. The Coastal First Nations Dance Festival demonstrates that these traditions are very much alive, vibrant and relevant today. This opportunity for sharing will include performances, discussions and a CanDance regional meeting. The Network can support airfare for approximately 10 members. Participants will be responsible for additional costs, including hotel and performance tickets. If you would like to attend, you must complete the brief application form below. We hope to accommodate everyone who applies. If this is not possible, the board will review the applications and propose an alternate plan. The deadline to apply is January 29th, 2018.